On Wednesday of this week we received another three oiled Northern Gannets in Fort Jackson and we continued washing and rehabilitating birds in Louisiana. Our search and collection teams, working under the direction of the US Fish & Wildlife Service, continued patrolling impacted and other areas in the outer regions of the Mississippi River Delta region. Many healthy looking clean birds were sighted in the areas they covered and a few partially oiled birds were sighted here and there but were unable to be captured. 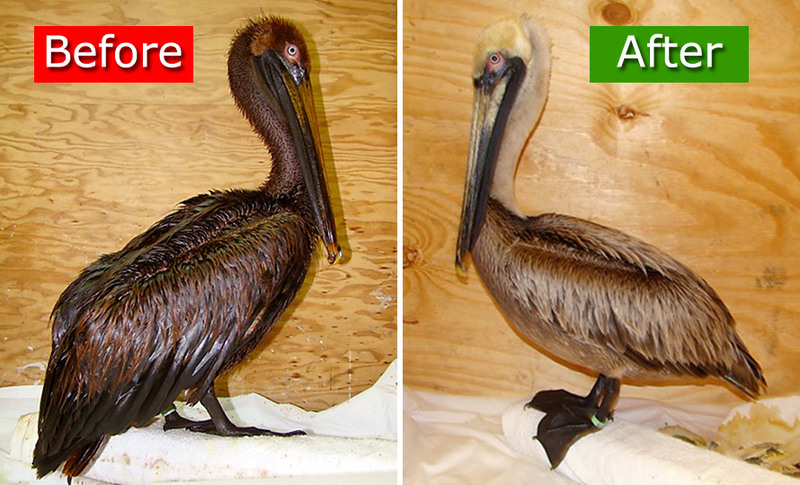 One oiled Brown Pelican came into the Pensacola, Florida bird rehabilitation center and one oiled Gannet came into the Theodore, Alabama rehabilitation center. The complete list of birds received and under care are listed on our website A total of 27 live oiled birds have received in to Gulf wildlife care centers. International Bird Rescue Research Center (IBRRC) is working with the main responder, Tri-State Bird Rescue of Delaware. IBRRC has about 20 response team members on the ground including veterinarians, wildlife rehabilitation managers and facilities and capture specialists. Jay Holcomb of IBRRC explains why it’s so important to remove oil from a birds feathers. 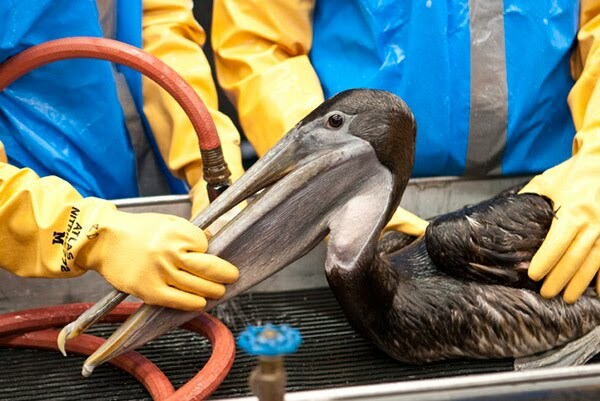 He also describes how an oiled pelican captured at the Gulf Oil leak is cleaned of crude this week at the Fort Jackson Oiled Wildlife Center in Louisiana. When a bird encounters oil on the surface of the water, the oil sticks to its feathers, causing them to mat and separate, impairing the waterproofing and exposing the animals sensitive skin to extremes in temperature. This can result in hypothermia, meaning the bird becomes cold, or hyperthermia, which results in overheating. 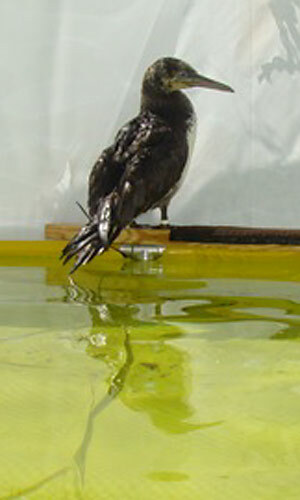 Instinctively, the bird tries to get the oil off its feathers by preening, which results in the animal ingesting the oil. In one of America’s biggest environmental disasters and the largest oil slick in the Gulf of Mexico since 1979, the BP Mississippi Canyon spill continues to enflame public and political sentiment. Now, as experts scramble to stop the oil leak, National Geographic Channel will air a documentary on what happened to the Deepwater Horizon as a blowout blew it apart, killing 11 of the 126 men on board, sending oil gushing toward the coastlines of Louisiana, Mississippi, Alabama and Florida. The special contains never-before-seen video shot by salvage crews as they battled to move close to the burning rig. 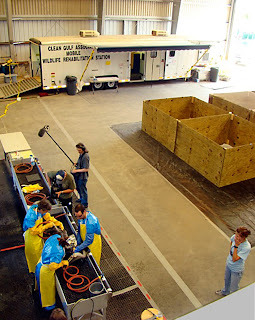 Nat Geo will broadcast a one hour special entitled “Gulf Oil Spill” Thursday, May 27 at 9 pm on the National Geographic Channel. Tuesday was a good day for the capture teams on the water as the weather allowed our teams, who are working as part of the U.S. Fish & Wildlife Service (USFWS) bird capture program, to cover a large area of water. Over 6,000 birds were sighted and most of them were clean. 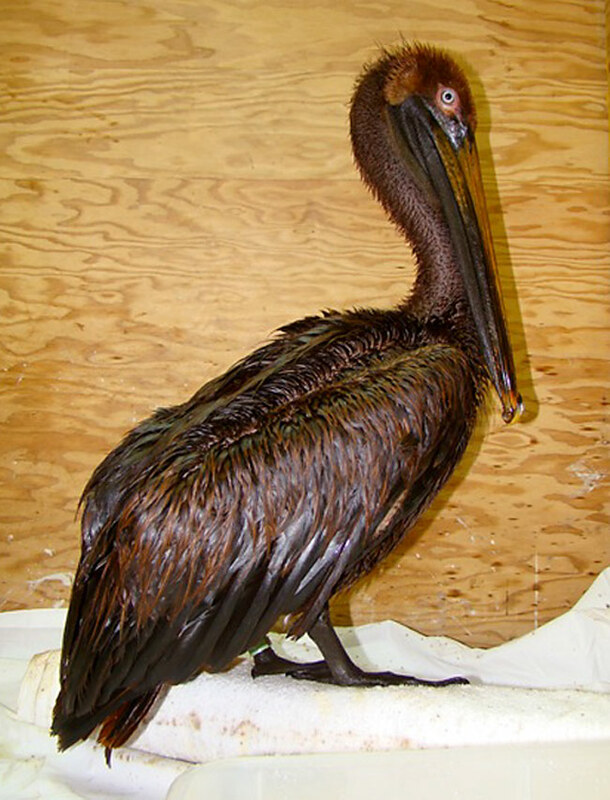 Oiled birds were found here and there and a total of 4 oiled birds were brought into the Fort Jackson bird rehabilitation facility in Louisiana – a brown pelican, least tern, northern gannet and a laughing gull. One oiled brown pelican was captured and brought into the Alabama facility on Tuesday also. Search and collection efforts and the rehabilitation of the birds at these facilities are continuing. The oil spill involves a ruptured drilling platform approximately 50 miles off the Louisiana coast. 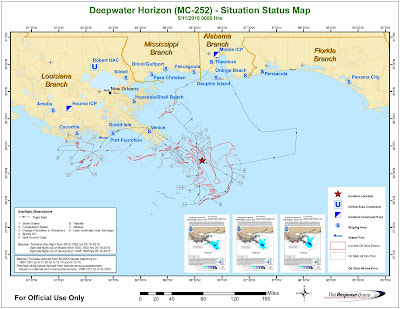 The drilling rig, the Deepwater Horizon, exploded on April 20, 2010 and sank in 5,000 feet of water. The leak continues to spill oil into Gulf waters and BP has made some progress in plugging the gush of crude from the ocean floor. So far, experts believe the amount of oil in the water has surpassed the 11 million gallons spilled during the 1989 Exxon Valdez disaster. Yesterday was a hot but clear day in the Gulf of Mexico and it was a good day for the teams to get out in the field in all areas. In Louisiana the teams spotted many oiled terns and gulls that are still able to fly and will be working with teams from the USDA and U.S. Fish & Wildlife Service (USFWS) to see if it is possible to capture them with net guns. They also saw a lot of oil impacting the shore in the South Pass area of the Mississippi River basin. The crews witnessed a large fish kill and unusual floating blobs of oil below the surface of the water. It is assumed that it is oil mixed with dispersant but not confirmed. The situation is disturbing to all of us but we are working within the current structure to provide the best services that we can to help capture and rehabilitate oiled birds. In Louisiana we received another Northern Gannet that workmen plucked out of the water in one of the oiled areas. We also received an oiled Laughing Gull and an Oiled Starling. Although all the centers are receiving rehab birds, birds with other injuries but not oiled, no other oiled birds from this spill were captured. 1. Alaska has hundreds of thousands of surface rafting (resting), diving and feeding birds, (Puffins, Murres, Auklets, Cormorants, Loons etc.) The Gulf of Mexico has fewer surface rafting birds but more plunge feeding birds (pelicans, gannets, terns) but the pelicans and terns spend a lot of time roosting on the outer islands and not on the water. So, impact of large rafts of these birds is unlikely. It’s more a case of individual birds plunging into oily water which is why we are getting gannets and pelicans. 2. The warm weather here allows oiled birds that are still flighted to stay warm for longer periods of time whereas even the smallest amounts of oil that penetrate to the skin of birds in cold climates puts them at immediate vulnerability to hypothermia and therefore death. 3. In Alaska there were many predators such as bald eagles and bears who took many of the oiled birds before we could get to them. In the gulf we do not have those predators on the outer islands but there are coyotes and raccoons on some of the islands. We now have received 15 oiled birds since this incident began. Louisiana – On Saturday we had a visit from Ken Salazar, the Secretary of the U.S. Department of the Interior. Rebecca Dunne from Tri-State Bird Rescue and I gave him a tour through the Fort Jackson Center and allowed him to get a close up view of our team washing the latest oiled Brown Pelican that we received. 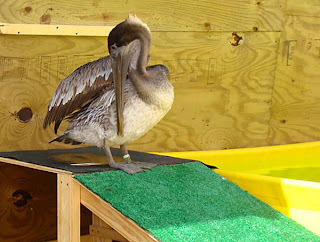 The female pelican is a two year old that is a very sweet bird found in Grand Isle to the west of us. She is now outside with the other pelican and doing well, both are eating a lot of fish. For the last two days our capture teams in Louisiana were mostly grounded due to intense thunderstorms and lightning strikes on the water. Not safe! We took this time to check out land based pelican and tern roosting areas but no oiled birds were spotted. The reports we are getting now are about birds out in the deep water oiled areas and on some of the islands but you have to have safe access to those areas. We are wading through politics and weather to get to those places to assess and capture oiled birds. Alabama – Our oiled bird rehabilitation center in Alabama received 7 sick non-oiled, lethargic brown pelicans and 1 laughing gull from that area. They were discovered soon after a fish die off in the area and there are concerns that they may have botulism and it may be connected to the fish die off. 5 pelicans and the gull are still alive and they are temporarily being cared for at that facility until plans for their transfer to a rehab facility are completed. Mississippi – Our center in Gulfport received an oiled Gannet on Saturday and it is doing well. The bird will be washed soon. The center development and problem solving is coming along well. 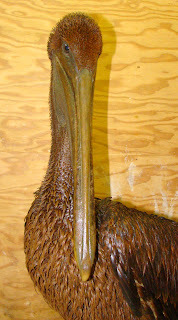 Florida – Our center in Pensacola received an oiled gannet on Saturday also and it is doing well. The bird will also be washed soon. Back at Home at our California Bird Rescue centers– It has taken a few weeks for us to get the wildlife centers on line here in the Gulf states and get a handle on this program and to understand and infiltrate ourselves into how its all working in this spill. In the mean time our centers at the Los Angeles and San Francisco areas are in spring mode and getting busier by the day. In that sense this spill could not have come at a worse time. In order to support our staff and volunteers back at home in Cordelia (Northern California) and San Pedro (Southern California) we are hiring on extra summer help at both centers to make sure that the clinics are supported and run as smoothly as possible. Also, we will probably be shifting our main clinic rehabilitation staff out to give each of them opportunities to work in the Gulf. We will be evaluating and are developing this plan daily as things progress here in the Gulf and we gain a better idea as to how long we may be staying. I will post more on how we are managing the spill, the centers back home as I have something to more to report. International Bird Rescue is working with the main responder, Tri-State Bird Rescue of Delaware. IBRRC has about 20 response team members on the ground including veterinarians, wildlife rehabilitation managers and facilities and capture specialists. The oil spill involves a ruptured drilling platform approximately 50 miles off the Louisiana coast. The drilling rig, the Deepwater Horizon, exploded on April 20, 2010 and sank in 5,000 feet of water. More than 100 workers scrambled off the burning rig in lifeboats. 11 workers are missing and presumed dead. 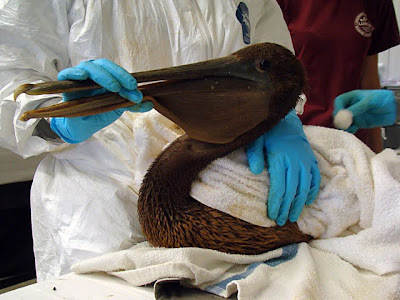 Response Team members, including IBRRC’s Heather Nevill, clean an oiled Brown Pelican Saturday at Fort Jackson, Louisiana Oiled Wildlife Center after being rescued at the BP-Deepwater Horizon oil leak in the Gulf of Mexico. U.S. Interior Secretary Ken Salazar (baackground in video) visited the center over the weekend to see first hand how one of four rescue centers are setup to handle oiled wildlife. The Fort Jackson can handle 120 oiled birds. Other wildlife centers are up and staffed in Theodore, Alabama. Gulfport. Mississippi and Pensacola, Florida. Note: Our Executive Director Jay Holcomb provides background narration in this AP Video Report. Yesterday we received one heavily oiled Brown Pelican at our Ft. Jackson Oiled Wildlife Center that was found near Grande Isle, Louisiana. We are expanding our capture efforts west towards that area. Our Gulfport, Mississippi center received one dead oiled Surf Scoter. Most of the capture team in the Louisiana was grounded for good part of the day due to high winds. Bird search & capture efforts continued in the Mississippi, Alabama areas. We will keep you updated on any new developments. International Bird Rescue is working with the main responder, Tri-State Bird Rescue of Delaware. IBRRC has 16 response team members on the ground including veterinarians, wildlife rehabilitation managers and facilities and capture specialists. >Photo above: Heavily oiled Brown Pelican rescued at Grande Isle, LA on May 13th. After capture, an oiled Brown Pelican, left, awaits washing at the Fort Jackson, Louisiana Oiled Wildlife Center. The same pelican, right, a few days later after it was washed at the Gulf Oil Spill Wildlife Response in May 2010. After stabilzation, a health exam and supportive care we use a 1% Dawn dishwashing solution to clean birds of petroleum products. On Wednesday the Alabama Oiled Bird Rehabilitation center received its first oiled bird, a Royal Tern. It was captured on Horn Island. Continued efforts to search that island and others in that region are ongoing. The other centers did not receive any new oiled birds. Half of our Search & Collection teams in the Louisiana were grounded yesterday due to high winds and unsafe seas. The other half was able to work some areas near the Eastern side of the Mississippi River delta area and spotted a few oiled pelicans but were unable to capture them. The governor of Louisiana, Bobby Jindal, visited us for a tour at the Fort Jackson Oiled Bird Rehabilitation Center. On Tuesday we received an oiled northern gannet from the Grande Isle area to the west and an oiled laughing gull from one of the offshore islands. Unfortunately the gannet died overnight but the gull is doing well as it is lightly oiled. We continue to send out our search and collection teams in search of oiled birds. They attempted capture on a few oiled brown pelicans yesterday but the birds were flighted and strong. over 200 baby pelicans after crude oil from a broken pipeline was strewn over one of the islands in the Breton Island Refuge during a tropical storm in 2005. They also partnered on a South Africa rescue effort in which 20,000 endangered African Penguins were oiled in 2000. • Oiled shoreline: call 1-866-448-5816. The oil spill involves a ruptured drilling platform approximately 50 miles off the Louisiana coast. 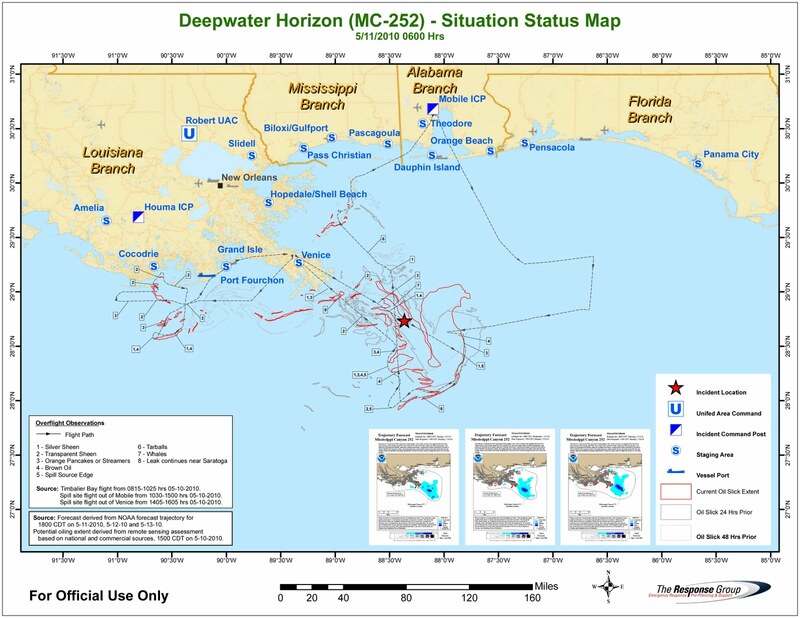 The drilling rig, the Deepwater Horizon, exploded on April 20, 2010 and sank in 5,000 feet of water. More than 100 workers scrambled off the burning rig in lifeboats. 11 workers perished in the disaster. The ocean floor crude rupture is now gushing at least 5,000 barrels — or 210,000 gallons — of oil a day. While engineers continue to work feverishly to cap the well, the oil slick is now approaching 4,000 square miles. Booms protecting nearby islands and beaches and chemical dispersants have kept much of the oil from reaching gulf shores. Shifting winds are expected to move more oil toward shore this week. The Deepwater Horizon oil blow out continues to frustrate responders as as rough seas today hampered the dispatch of crews to new shorelines impacted by oil, the The Times Picayune said this afternoon. Louisiana state officials say the Gulf of Mexico oil spill has reached Whiskey Island shoreline – one of the barrier islands off the coast of Terrebonne Parish. Other areas affected by the slick include South Pass and the Chandeleur Islands. 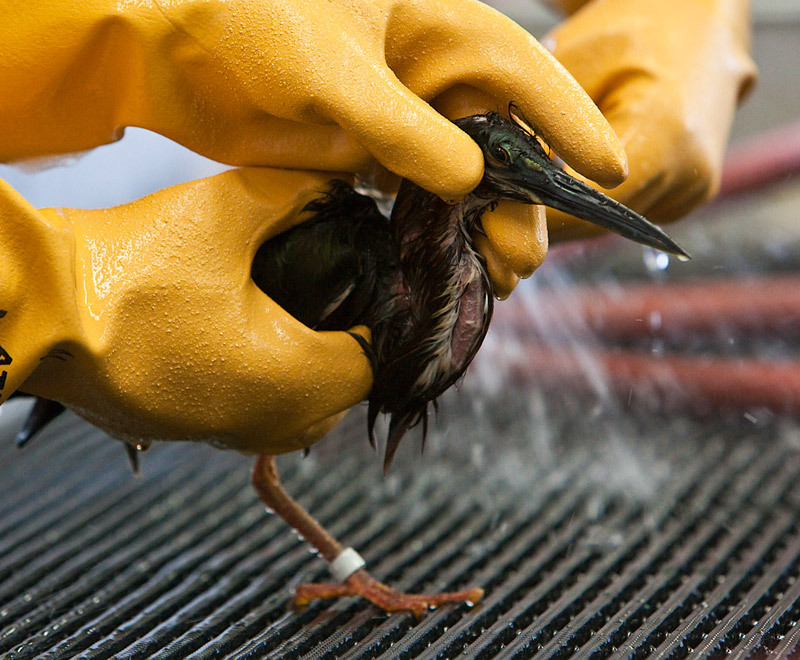 On day 10 of IBRRC’s continuing Gulf Oil Spill response, 2 cleaned birds were released in Florida. 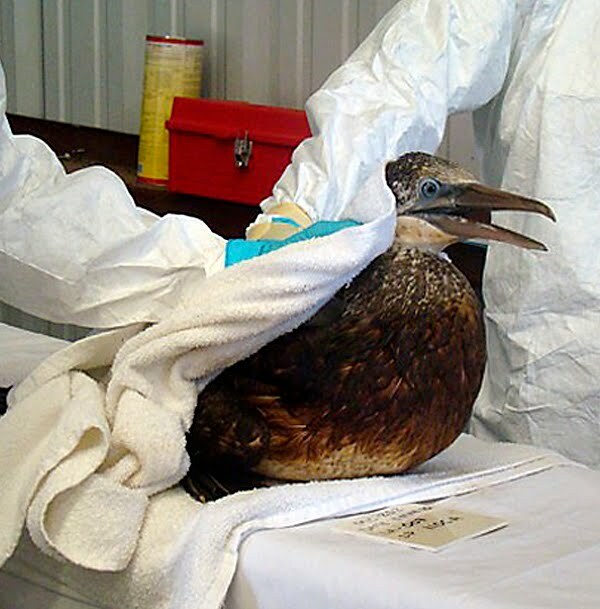 They are only 3 oiled birds now in care, but as the spill continues to move onshore, the potential for more oiled wildlife is still a strong possibility. Yesterday, May 10, we sent the northern gannet (bird number 1) and the first pelican with a US Fish & Wildlife Service representative to be released in Florida. The release was successful. We are down to 2 live oiled birds in LA (one brown pelican and one green heron). One live gannet remains in care in Florida. We are still receiving visits from many facets of the media. We are expecting a visit from the governor of Louisiana today and tomorrow we are hosting Peachy Melancon, wife of Senator Melancon. 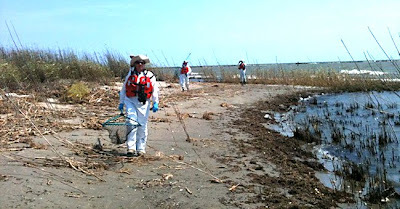 Our field teams are still working the outer islands in Louisiana with the U.S. Fish & Wildlife Service (USFWS) and have yet to capture or see any severely oiled wildlife. They have only seen spotty oiled birds that are flighted and appear healthy. We are still getting many requests for volunteering. As you can see my these blog postings, we are very quiet and are spending our time searching for oiled birds and continuing to set up rehabilitation centers in 4 states in expectation of the worse case scenario which would be if strong winds or storms pushed the oil onto bird breeding islands or in the coastal marshes. The volunteer hotline remains open for people to leave their information on and they will be activated if and when those resources are needed. Thank you for your patience in this matter. This is a very unusual spill as the potential is great but the impact to date has been minimal at least on bird species. So, its a bit of a waiting game but that has given us the time to prepare for a large scale event. I will keep everyone updates as things happen. In the mean time, we worked on a spill in this area a few months before hurricane Katrina. 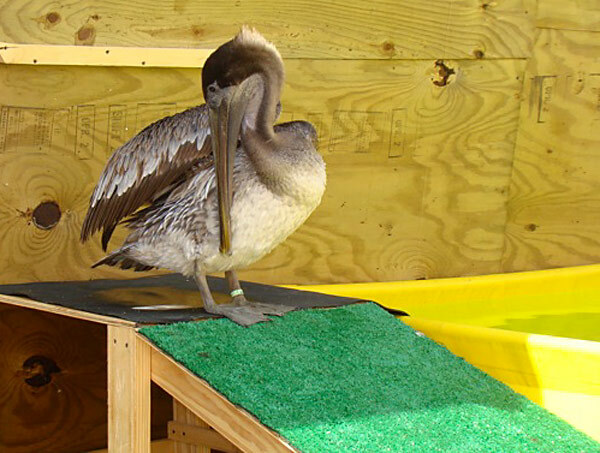 Read our article about how we cared for over 200 oiled baby pelicans in 2005. That will give you an idea of how we work in this region. Please note: Accredited media wishing to cover the release of the birds should be at Centennial Tower in the refuge by 3:30 p.m. Monday, May 10. The birds are a Northern Gannet and a Brown Pelican. The Gannet, a young male nicknamed “Lucky” by the workers who rescued him, was found April 27 in the Gulf near the source of the link. Clean-up workers on a boat reached out to him with a pole and he jumped on it. He was brought to the Bird Rehabilitation Facility at Ft. Jackson, Louisiana, on April 30. The Tri-State Bird Rescue team, which includes the International Bird Rescue Research Center, evaluated Lucky and found he was about 80 percent oiled, giving him an orange appearance. He was thin and dehydrated, so wildlife veterinarian Dr. Erica Miller gave him intravenous fluids several times, as well as oral fluids and Pepto-Bismol for oil he may have ingested. He was washed with a Dawn detergent solution on May 1, and has been in an outdoor pool for a few days now, gaining weight. The pelican, also a young male, was found May 3 on Stone Island in Breton Sound on the Louisiana coast by a team that included personnel from the Service, the Louisiana Department of Wildlife and Fisheries and the U.S. Minerals Management Service. He was taken to the Ft. Jackson facility by helicopter the day he was rescued. He was thin and moderately oiled over his whole body. The Tri-State Bird Rescue Team, and wildlife veterinarian Dr. Miller treated him with IV and oral fluids, and started hand-feeding fish to him the first day. He was washed on 4 May and has been in an outside pool for several days, gaining weight. Pelican Island National Wildlife Refuge was the nation’s first wildlife refuge, established by President Theodore Roosevelt in 1903. It was selected as the release site because it is located within the Indian River Lagoon, the most biologically diverse estuary in the United States. It has a large population of Gannets and Pelicans for the two rescued birds to join, and is out of the current oil spill trajectory. The birds will be released by Dr. Sharon K. Taylor, a veterinarian and Environmental Contaminants Division Chief for the U.S. Fish and Wildlife Service. On May 8 we sent out 6 field teams, under the direction of the US Fish & Wildlife Service, to continue to look for oiled birds. Only some spotty oiled gulls have been sighted so far. No new oiled birds have been recovered. The 4 live birds in care at Ft. Jackson, LA and the one live bird in Pensacola, FL are all doing well. The bird rescue group has 16 response team members on the ground including veterinarians, wildlife rehabilitation managers and facilities and capture specialists. There are now four Oiled Bird Rescue Centers in Fort Jackson, Louisiana, Theodore, Alabama, Gulfport, Mississippi and Pensacola, Florida. Accredited media staff can visit the Fort Jackson, LA rescue center any day from 1 pm to 2 pm. It’s located at MSRC:, 100 Herbert Harvey Drive, Buras, LA 100 Herbert Harvey Drive, Buras, Louisiana. The ocean floor crude rupture is now gushing at least 5,000 barrels — or 210,000 gallons — of oil a day. While engineers work feverishly to cap the well, many officials worry the leak could go on for months.